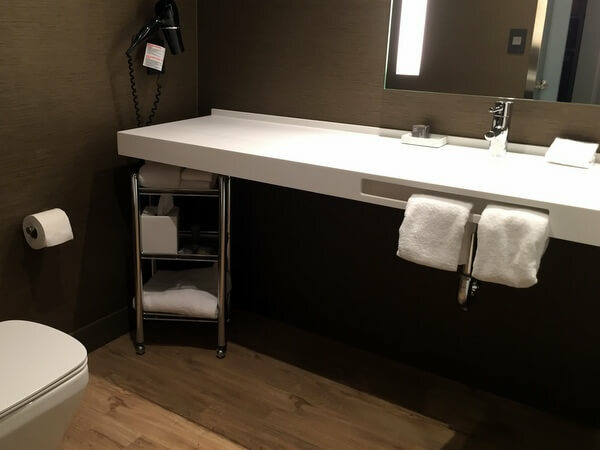 Opened in February (2017), the AC Hotel Portland Downtown, a Marriott branded property located at the corner of SW Third Avenue and Taylor Street, is trying to appeal to independent travelers who value style but appreciate value. The AC brand started in Europe (it’s named for its founder, Spanish hotelier Antonio Catalan), and according to the friendly front-desk staffer who welcomed my husband Alan and me for a weekend stay, this Oregon location is the 13th AC property in the U.S. 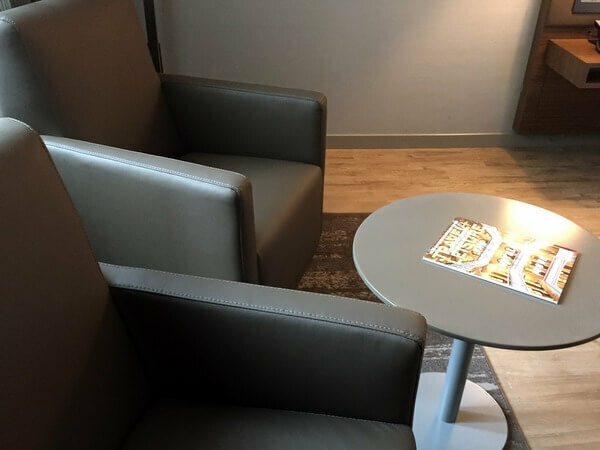 When you enter the lobby at the AC Hotel Portland Downtown, the check-in desk is on your right, while straight ahead is a coffee counter and a spacious lounge. There’s drink service from the lounge’s marble bar, and during our stay, plenty of guests lingered here at all hours, reading, chatting, or checking their messages; the hotel has free open Wi-Fi throughout the building. If hoteliers believe that millennials want space to mingle, this Portland hotel provided evidence of that trend. Original artwork around the hotel also helps reduce the “chain” feel. 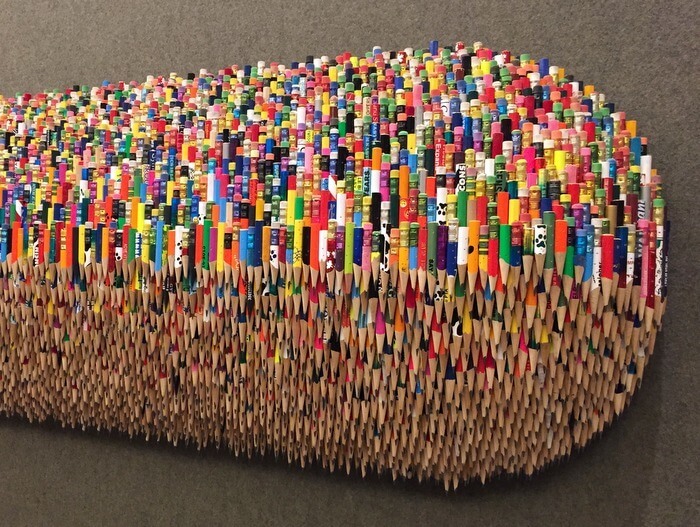 We spent quite a while examining a fascinating piece by Portland artist James Florschutz called “Number 2 Pencil Pixels” (shown in the photo above), mounted on the wall outside the small but modern fitness room on the lower-lobby level. It’s made of 6,000 brightly colored pencils. 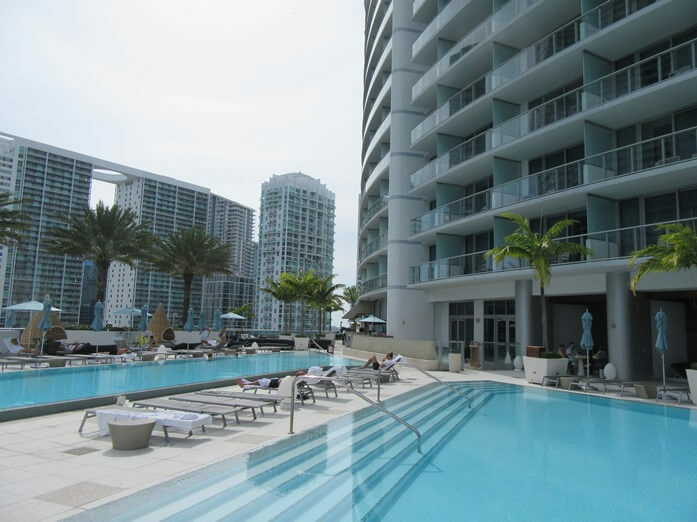 The front desk staffer explained that the AC ethos is to provide everything you need, while stripping out the extras. The hotel has no dedicated concierge, but the lobby staff can answer questions. 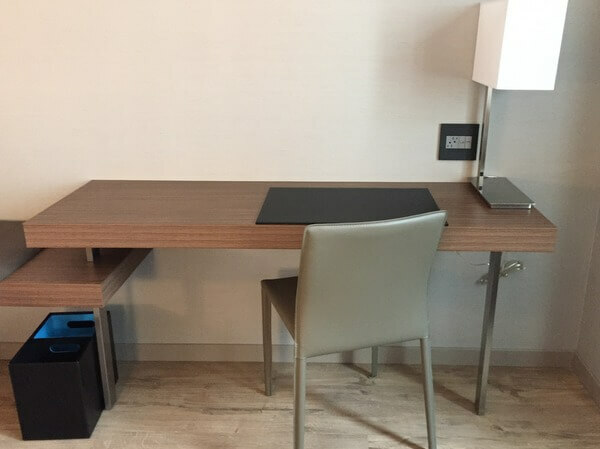 The 200 guest rooms in the 13-story tower don’t have alarm clocks, but they do have two electrical outlets and two USB ports at the work desk and on either side of the beds, which also have convenient reading lights. The room design is simple but modern, with walnut-hued furnishings, wood-grained floors, and white linens. In our fifth floor standard king room, which looked out on the roof of an adjacent building, two leather-like armchairs were comfortable for reading and close enough to more outlets that we could plug in our laptops. A flat-screen TV was mounted on the wall, and while our room didn’t have a full closet, there was a coat rack in the entry with enough space to hang a weekend’s worth of clothes. Also in the entry was a mini-fridge, safe, and one-cup coffeemaker. Although rooms aren’t large, their design helps them feel spacious enough. The standard kings measure 265 square feet; slightly larger rooms with a king bed and a sofa bed are 311 square feet. Rooms with two queen beds, totaling 333 square feet, are also available. The bathrooms, too, are spare but modern, with sleek white counters, chocolate-hued walls, and rainshowers. Inside the shower are dispensers of shampoo, conditioner, and body wash. Hairdryers are provided, but not robes or slippers. In the hallways, “hydration stations” replace the more old-fashioned ice machines, offering cold water to fill your own bottles or the pitchers supplied, and ice for your drinks. While the AQ Hotel serves a buffet breakfast for $15, we decided not to eat in the hotel, since Portland has so many excellent food options nearby. 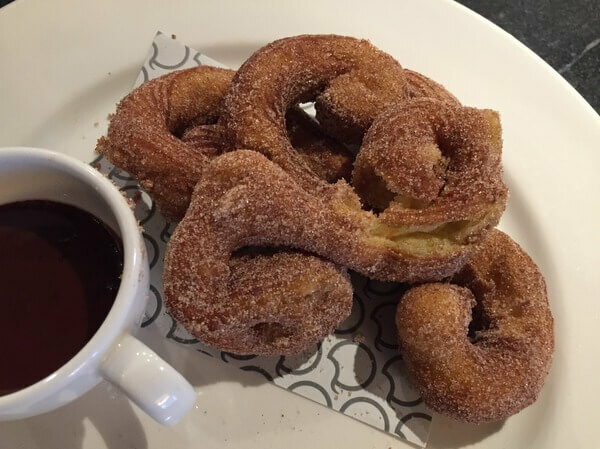 I enjoyed a particularly delicious brunch at Q Restaurant and Bar around the corner from the hotel, with some of the fluffiest churros I’ve ever had (shown above); they were bathed in a slightly spicy cinnamon sugar and served with a rich chocolate dipping sauce. 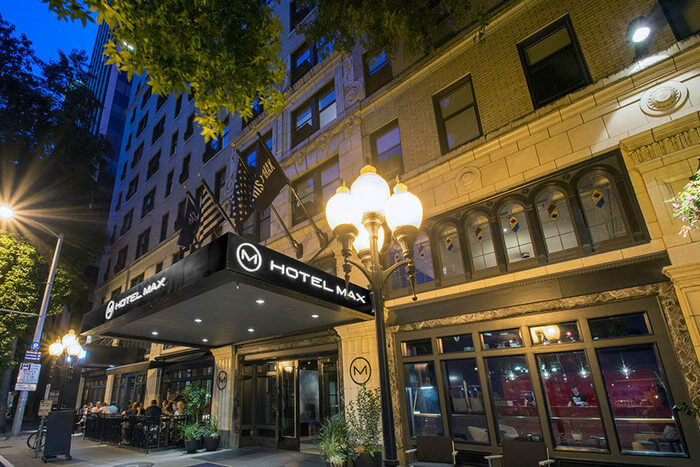 The hotel is also within walking distance of most downtown attractions, including Powell’s City of Books, the Portland Art Museum, the Pine Street Market, and several food truck pods. The Max Light Rail, which runs between downtown and Portland’s airport, stops two blocks away, and the light rail line that can take you to Amtrak’s Union Station is just a couple of blocks farther. Numerous bus lines stop nearby. 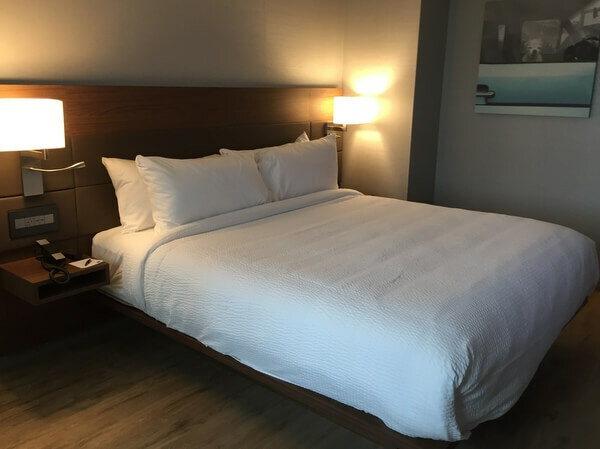 Double room rates at the AC Hotel Portland Downtown start at about $140/night, though standard rates in the $170-240 range are more common in the summer high season. Make your reservation directly online through the AC Hotel Portland website or try a booking site such as Travelocity or Hotels.com. 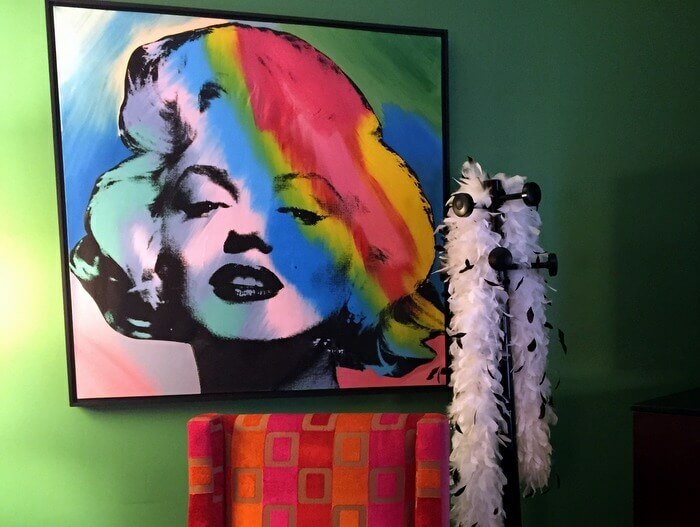 While the AC Hotel Portland Downtown doesn’t have as much personality as nearby boutique lodgings like Hotel deLuxe, Hotel Lucia, or even Kimpton’s Hotel Vintage, it still manages to shake off much of that “chain” atmosphere. And in a city that values “local,” “indie,” and “hip,” that makes it an option worth considering.